Some weekends I like to make believe that I’m a trendy New Yorker who lives in Tribeca. There’s just something about those cobblestoned streets that I (and just about everyone on StreetEasy) find so charming. Just blocks away from Taylor Swift’s loft (probably), I ventured upon a restaurant called Kori. The Californian in me initially assumed that “Kori” was just short for “Korean Food” (i.e. totes = totally, jelly = jealous). I later learned that kori means connection in Korean. A great concept, especially given that Kori connects us trendy New Yorkers to its own healthy and delicious take on Korean food. The high ceilings and ambient lighting provided a cozy yet elegant atmosphere that drew me in instantaneously. My friend and I were politely informed upon arrival that they would love to have us and we would probably be seated within the hour. Our hostess’ warm demeanor was starkly different from the slew of responses we received at every other Tribeca establishment earlier that evening. I had fully expected another incredulous head shake for daring to ask to be seated on a Saturday night without a reservation. We were guided past the bar and some (presumably Korean) instruments hanging on the wall to our table. The drink offerings included the usual (cocktails, wine, beer) along with soju and sake. The music playing was delightfully incongruous with the premise of the restaurant. Soul, blues, and jazz were going to be the stylings enjoyed alongside our Korean cuisine. We wanted to give our less-than-authentic Korean experience a little credibility, so we opted against the sake (which is Japanese but similarly rice-distilled) for the soju. Our hostess suggested the ginger soju, declaring that it would be soothing given the seasonal change in weather. She did not steer us wrong. It was indeed very comforting in an autumn sort of way. Even despite the delicious meat offerings (I was longingly eyeing a bulgogi wrap at the table next to me), I decided to don my vegetarian hat that night to accompany my herbivorous friend. The first thing that came to our table was a simple salad. It had lettuce and glass noodles that were peppered with a subtle vinegar and soy sauce. I almost declined it because we hadn’t ordered a salad but my friend gracefully pointed out that everyone else’s tables were similarly adorned with a slanted bowl. The appetizer we chose was topoki, a spicy, roasted rice cake mixed in with flavorful scallions and onions. The rice cake was presented in little rolled-up cylinders that were perfectly chewy and delicious. I admittedly went with a safe choice for my entrée, the dolsot bibim bop (a sizzling bowl of rice, vegetables, and choice of protein). The waitress mixed some of the gochujang (Korean hot pepper paste) into my bowl right in front of me. We shared a knowing glance. One that conveys that subtle sentiment— hit me again with that spicy sauce, sistah, I am brown after all. The combination of crisped rice from the bottom of the stone bowl and that perfect amount of gochujang came together with the fresh vegetables and grilled tofu to make a meal that was somehow deliciously satisfying without being heavy. I no longer felt envious of my carnivorous counterparts at the table beside us. 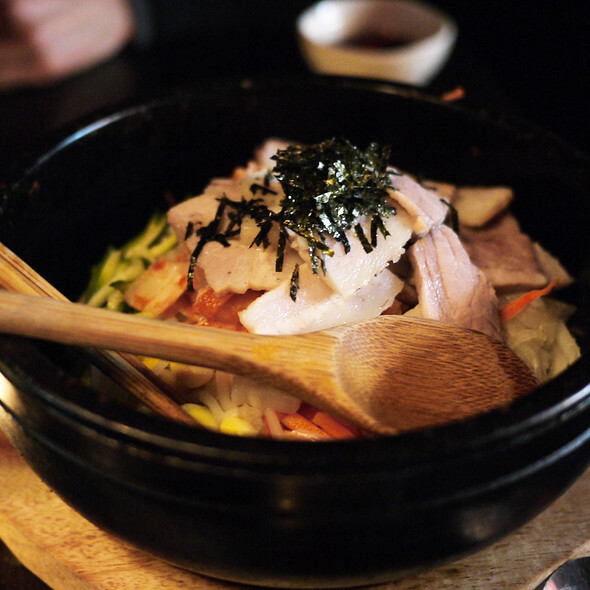 Granted, there are probably more authentic Korean experiences to be enjoyed in K-town. 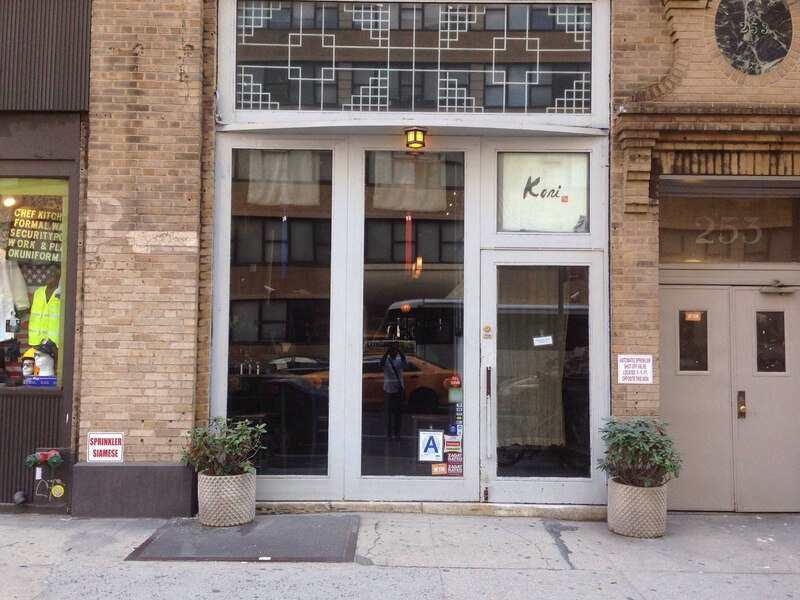 However, I would definitely go back to Kori in Tribeca. The atmosphere and delicious food made it my favorite kind of New York night—totally unplanned and unexpected yet somehow exceptional.